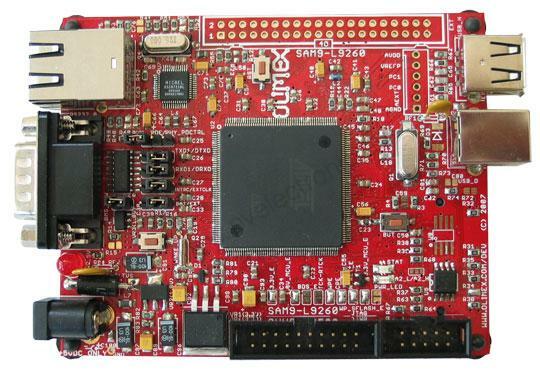 SAM9-L9260 is low cost development platform with ARM9 microcontroller, 64MB SDRAM and 512MB NAND Flash. The board have Ethernet 100Mbit controller, USB host, USB device, RS232 and 40 pin extension port with all unused SAM9260 ports available for add-on boards. SAM9-L9260 have waste amount of Flash and RAM and runs Linux, WindowsCE and other RTOS natively. RTC clock is backup with 3V Li battery. 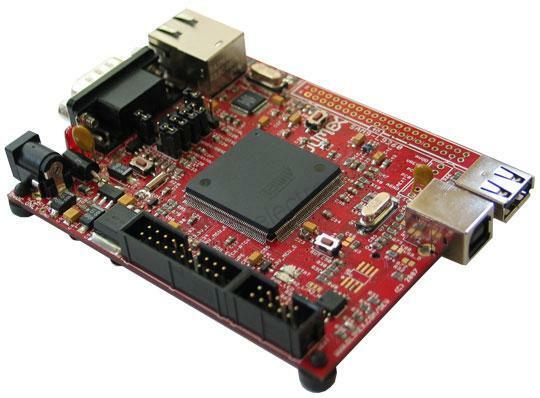 FEATURES: • MCU: AT91SAM9260 16/32 bit ARM9™ 180MHz operation • standard JTAG connector with ARM 2x10 pin layout for programming/debugging with ARM-JTAG • 64 MB SDRAM • 512MB NAND Flash (seen in Linux as silicon drive) • Ethernet 100Mbit connector • USB host and USB device connectors • UEXT connector • RS232 interface and drivers • SD/MMC card connector • one user button and one reset button • one power and two status LEDs • on board voltage regulator 3.3V with up to 800mA current • single power supply: 5V DC required • power supply filtering capacitor • 18.432 Mhz crystal on socket • extension header • PCB: FR-4, 1.5 mm (0,062"), soldermask, silkscreen component print • Dimensions: 100 x 80 mm (3.94 x 3.15") FAQ Q: What the Linux CD content is. A: Although it's written in the user manual we often get this question. 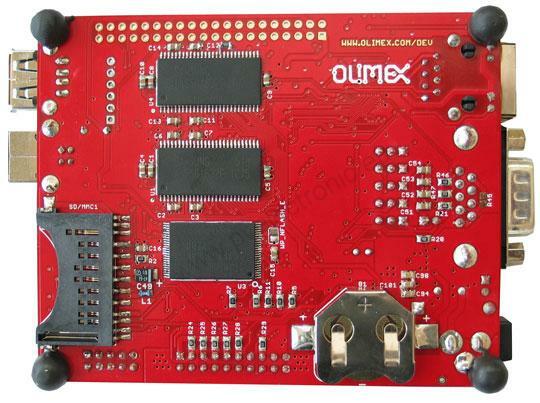 The linux kernel used by the preinstalled demo on the board is based on the stock linux 2.6.23 kernel with patches from http://maxim.org.za/at91_26.html and a custom one that adds support for the Olimex-L9260 board. All of these patches are available on the CD. Since then, the extra Olimex patch has been integrated in the main atmel patchset and is no longer needed. A full list of supported peripherals is available at http://maxim.org.za/sam9.html, and, just to summarize, all on-board peripherals are working with the exception of the RTC clock. It should be supported in the most recent releases, but we have not verified it yet.